The nice thing about starting an online business is the lack of equipment you need in the beginning. If you aren’t a large start up, then you can get by without a few things for a while. You won’t need office equipment at first; you have a kitchen table you can use. You won’t need office furniture at first. If you are an at home start up, you can use your computer and a desk. 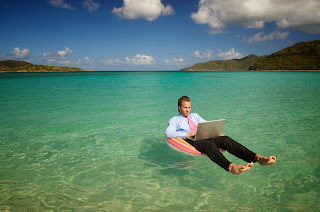 If you have a laptop, your office can be anywhere you choose it to be. As long as that computer is running at top performance, your office is always open. If you have something that needs to be sold and marketed, then you’re going to need a high risk merchant account. The reason is for the new account, and as a new online business, you will likely fall into that category. It does not mean that you yourself are high risk. It just means that you have bounced into an area that may require a high amount of refunds. Don’t worry, you won’t be there forever. Marketing: As a newbie to the block, you can do your own marketing. As you grow you can buy that option from someone that has more time than you. But for now, to keep the costs down, you get to be creative and marvelous. Go get ‘em tiger. Ask people you know to help with your advertising. Even though you are marketing, you also need to advertise. If they don’t hear or see you, they don’t know you are there. So ask around, find out who is willing to help you advertise in not so exact ways. Negotiate with your merchant servicer. Keeping the costs down is vital to your survival. If you can keep the per transaction fee down on your merchant account, you will have a little more to survive on as time goes by. If you can keep the basic costs down, then the rest will be cake. It’s always best that way, so you can eat it too. Keep things on the down low and shop until you have found items you can afford, but won’t look tacky as you go through your growth period. Good luck with your new company and here’s hoping this helped…… even just a little.